EDC Trustee Vijay Kumar was one of seven professionals honored during the New England Choice Awards on October 28. Kumar, associate dean of digital learning at the Massachusetts Institute of Technology, received the award for Excellence in Academics and Digital Learning. Kumar was selected for his body of work, including his leadership of strategic education initiatives at MIT and his long-time focus on integrating information technology into education. In India, he is involved in a digital learning initiative to advance educational quality and access through technology in underserved Indian schools. A short video about his achievements was shown during the event. 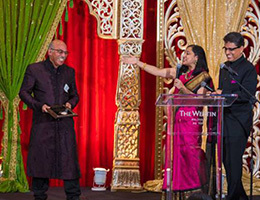 The awards were presented by INE Multi Media in collaboration with INDIA New England News, a magazine serving the South Asian community. More than 400 entrepreneurs, philanthropists, business and industry leaders, and educators attended the awards gala, which was held at the Westin Hotel ballroom in Waltham, Massachusetts.